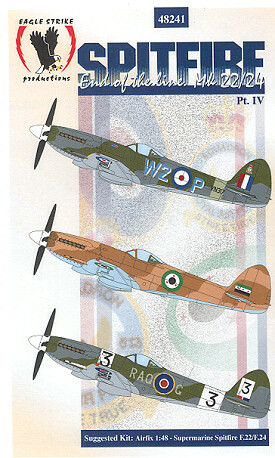 Continuing with the late war Spitfires is this sheet on F.22/24 Spitfires. The only really good kit in this scale is by Airfix, and it is one of their better ones. Unless noted, the camouflage for these planes is normally Dark Green/Ocean Grey over Medium Sea Grey. I've found it a bit odd that an RAF land based plane would mostly use nautical shades of paint, but there you have it! The first option is an F.24 from 80 squadron during the occupation of Germany. This accounts for the shaded code letters and rather unorthodox fuselage roundel. Plus, when you are squadron leader, you can bend the rules a bit. The next one is a Syrian F.22 from 1967 and destroyed on the ground during the Six Day War. It is in locally produced shades of light and dark brown upper with a light blue underside. Finally, an F.22 from 610 Sq all decked out in racing numbers for the Cooper Air Race of the late 1940s. Eagle Strike provides the fuselage numbers separately in case you'd rather paint the white band. The cannon barrels on this one are painted white. 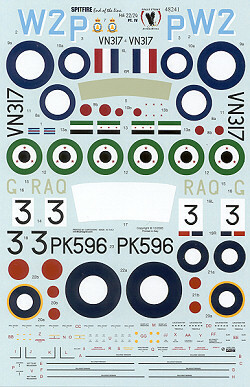 The sheet provides insignia for all and full data markings for one.